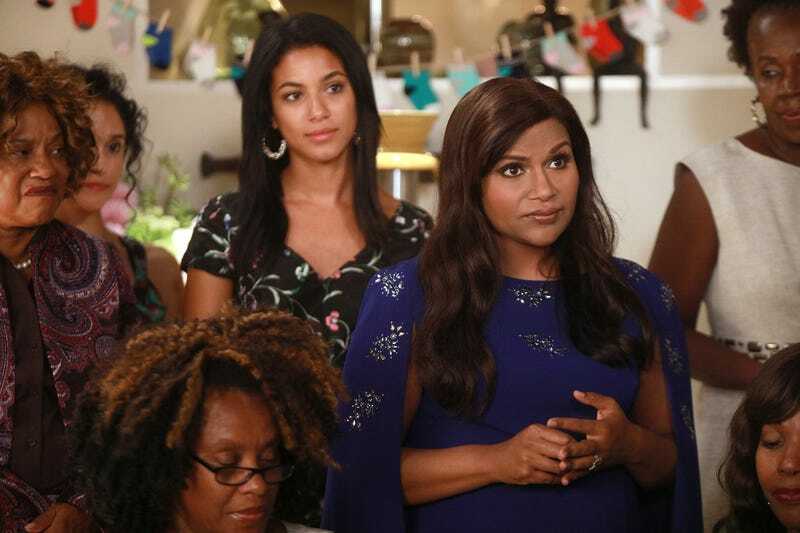 The Mindy Project often tries so desperately hard to be provocative and edgy with no clear intent, falling into the trap of assuming that being wildly politically incorrect is funny in and of itself. Most of the employees of Shulman & Associates are very flawed people, but they’re often unaware or at least in denial of their flaws, which is especially true for Mindy. The Mindy Project is far from being akin to It’s Always Sunny In Philadelphia in its portrayal of bad people doing bad things, but sometimes it weirdly feels like The Mindy Project is trying to channel the latter in selfish, offensive characters like Jody, Peter before him, and even Mindy. Here’s the key difference: Even at its most depraved, It’s Always Sunny remains sharply funny. The Mindy Project does not. And none of this is particularly surprising! I’ve come to expect this kind of unfunny nonsense from the show. Danny has gotten away with being racist toward Mindy’s culture so many times, and he does so again here, referring to the food her mom cooks as “globbity gloop.” Mindy forgives him for being offensive since his mom is dying of cancer, but it’s not like this is an isolated thing. Mindy’s outburst about an immigration “wall” in the cold open is a perfect example of the jarring, pointless “jokes”—if it can even be called that—this show throws around recklessly. Every reference to Trump this season has been broad and targetless. This all brings me to the most glaring issue with this episode and this final season: Jody and Mary. Relationships are the foundation of this show, s they should probably be at least a little convincing. Mary announces to Mindy that she is in love with Jody. Look, this show often moves quickly with its romances, but this happened out of nowhere. In her speech to Mindy, Mary says that their relationship is good for Jody, that he’s evolving. Based on Mindy’s reaction later in the episode—when she stands up and declares that they should all be supporting Jody because they’re all sappy romantics and he is now, too—Mary’s words are supposed to be interpreted as romantic? But her choice of words conveys something much different. By stressing that the relationship is good for Jody because it’s making him a better person, Mary suggests that she feels compelled to rehabilitate him, to keep pursuing this relationship for his benefit rather than thinking about herself. This idea gets reiterated a lot in romantic comedies: the notion that women should date bad men because they can make them better men. This of course completely ignores what these women need or want, focusing completely on the men and what they get out of the relationship, reiterating women as the “caretakers.” So I kept waiting for the episode to make those connections, and it never does, instead just perpetuating these rigid gender roles in Mary and Jody’s relationship, which makes it all the more difficult to swallow the repeated insistence that Jody is less sexist now. This all reiterates the fact that Hulu ordering just 10 episodes for the final season was a weird decision for the show, which always had episode orders of over 20 until last season when it did 14. It’s telling that the most compelling and coherent part of this episode is all of the relationship work between Danny and Mindy. The conflict between them here resonates because it also builds on character work that has been unfolding and evolving for many seasons. With so few episodes to construct a final season, was it really worth throwing in so many new, hastily developed storylines like this Jody and Mary one? Even the Jeremy and Jody arc in the episode plays out more convincingly, and the play on the last-minute-running-in-the-rain-to-declare-your-love scene that swaps romantic love for platonic love between two guy friends is the kind of rom-com trope-twisting that this show does best. But in its final season, The Mindy Project is doubling down on some of its greatest flaws. Next week is the series finale! If you forgot, it’s because there has been very little sense of urgency this season! According to Danny, jicama is all the crunch of apple with the taste of air.